Golygfa Deg, or "Fair View" in Welsh, is a 3-bedroom holiday cottage with stunning views over the Teifi estuary. Set in the village of Gwbert, just 5 minutes drive from the market town of Cardigan, the cottage is within easy reach of numerous beaches, family attractions and historic sites. It is also walking distance from two popular restaurants and an 18-hole golf course, while regular bottle-nosed dolphin and seal-spotting boat trips leave from the pontoon at the edge of the village. After recent re-modelling, the property now features a large, open-plan kitchen/lounge/dining room that leads out onto a large south and west-facing patio deck. There is a secure rear garden and a self-contained 'games room' with a full-sized table tennis table, dart board, X-Box360 console, DVD player and selection of board games. Pets are welcomed and unlimited Wifi connection is available. Our cottage is so convenient for the beaches and the local town of Cardigan. Plus the nearby golf course, the coastal path, boat club and two great eateries are within walking distance of the front door. The best bit is the ability to sit on the patio deck at the end of a fun-filled day with a glass of wine and watch the sun set into Cardigan Bay - just bliss! Family bathroom with bath/shower sink and WC. Separate shower room with sink and WC. Controllable radiators in all rooms, electric fire in lounge. Large and airy open plan lounge/diner with two three-seater sofas, large pine dining table and chairs, 32" Sony LCD TV, DVD player and iPod docking station. Large window and glazed patio doors open onto raised decking area overlooking sea views. Well-equipped kitchen with ceramic hob, electric grill/oven, fridge freezer, washing machine, dishwasher, microwave, toaster and kettle. GEAR 4 iPod docking station. A selection of board games are available, including playing cards, a chess / draughts / backgammon set, Ludo, Monopoly and Senior Moments. Dry slope skiing is available at Llangrannog, around 15 minutes by car. Two tennis courts are available free of charge (no booking required) a few minutes drive away. The courts are situated next to Cardigan Rugby Club, on the left hand side as you drive towards Cardigan. Walking distance to a challenging 18-hole championship course at Cardigan Golf Club. A hybrid links/parkland course, Cardigan benefits from good drainage which means that play on regular tees and greens is maintained for the majority of the year. The course measures 6,455 Yards (Par 72) from the championship tees and offers a stern challenge when a stiff sea breeze is blowing. The nearby Cliff Hotel also has a 9-hole course within its grounds and there are several other courses within 30 minutes drive. Outside: The secure rear garden features a large grassed area with views of the sea (perfect for football matches and picnics) as well as a more sheltered gravel area adjacent to the house. Outdoor furniture and a BBQ are provided. 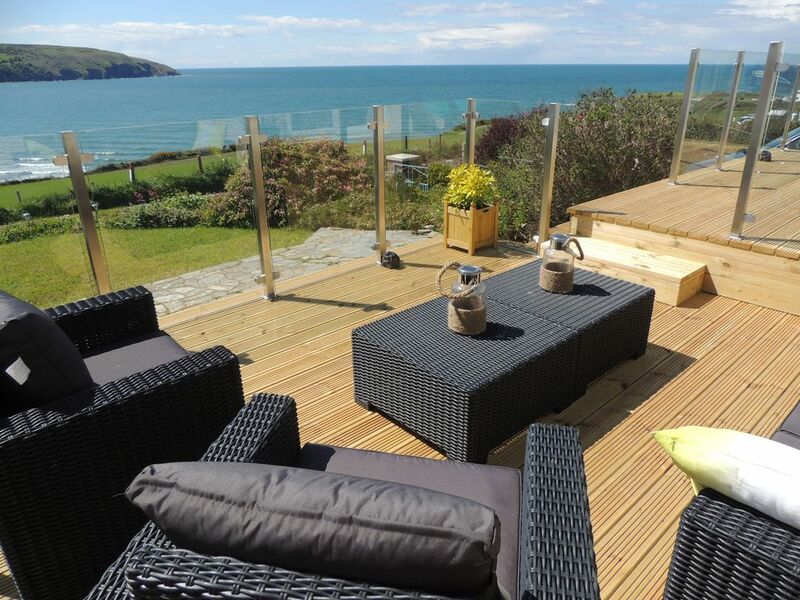 The front garden has a raised decking area with stunning sea views. Cleaning / Towels / Linen / Maid service: The property is professionally cleaned on every changeover day, with fresh towels and linen provided for up to six people. Additional cleaning can be arranged for guests staying for a week or longer. Other: GAMES ROOM Self-contained games room, fully equipped with a full-size table tennis table, dart board, table football, TV and X-Box 360 with a selection of popular games. The bungalow had everything you may need.for week long break. A few things require upgrading and maintenance to justify the rental price. On the whole enjoyed our half term stay. Thanks for the review Peter and I’m glad you enjoyed your stay over the half term week. Over the next few weeks, there’s going to be a bit of a make-over at Golygfa Deg. This includes a new master bedroom and a brand new open plan kitchen that will create one living space across the entire front of the property, with un-interrupted views of Teifi estuary and out into the bay. Tired property in need of improvement. Although a fantastic view and reasonably comfortable we found the property somewhat disappointing if staying for 2 weeks. We had to purchase air fresheners to subdue the stale smell in various parts of the property, particularly in the hall, which seemed to be coming from the bunch of twigs, in the lounge, which was probably the rug ant the worst is the back bedroom. The property is advertised with a washer/dryer which is just a washing machine so no adequate drying facilities for clothes except a small, flimsy airer and a collapsed rotary line in the garden which needs relocating to the lower shingle area. The radiator in the main bathroom was not working as required bleeding so initially quite cold in there. The driveway could do with the plants cutting back as difficult to get out of the car if reversing in. We have stayed in many places in this area and would only rate it a 3 star compared to others, not the 5 star rating given – would not return. We spent two weeks in this comfortable , airy bungalow , which had everything we could have wished for with magical views from the front and a big enclosed garden to the back which was great for our little bulldog . There was nowhere else I wanted to be , this being a special part of a beautiful area . Hope to return , no matter what the weather! Thanks for the review Julie and I'm glad you enjoyed your stay. Please come back any time! Stunning location ,perfect family holiday . clean and has everything you could possibly need (including a games room,where we had a lot of fun playing ping pong and darts) ..but the star of the show is the front terrace ,where you can watch the wildlife ,the tides and the sunsets .We visited Cardigan ,Poppit Sands and Newquay .There is a lovely coastal walk that you can join if you walk on the far side of the hotel at the end of the road .It takes you through the golf course . On the last night we went down there to toast the sunset and that's when we saw two dolphins .A perfect end to an unforgettable holiday ,and no airport at the end of it ! Thanks for the review Jane. Really glad you had a nice time and managed to see some of the friendly local dolphins! The decking and outdoor furniture was a nice touch and the view was beautiful. I think the Bistro further up the road was called the Flat Rock Bistro - the food was very good and I would recommend it. I would definitely consider coming back at some time in the future. The splash back at the back of the kitchen hob was glass and it was cracked - I think that needs to be replaced. On the whole we enjoyed our stay and the garden was a good pet friendly place to bring a dog. Thanks for your review, we’re glad you had a nice stay - the Flat Rock is very popular with our guests. Apologies about the hand towels, we try to place at least one in every room and the splash back is in the process of being replaced. Would love to welcome you for another stay. We had an absolutely wonderful holiday and have booked for next year already! The views are the best views we have ever had from a property (and we always book somewhere with a view so that is praise indeed!). Watching the tide rolling in and out, the wildlife, people on the beach - the changing weather and the AMAZING sunsets was awesome. The fact that you can do this from the living room if its not nice enough to sit outside is wonderful. The town of Cardigan is just less than 10 mins away in the car, so it is very conveniently located to have a look around the beautiful area. If you do book and go to Cardigan we can recommend the Fishermans Rest - it doesn't look anything special from the outside and some would be put off but please don't be!! the terrace overlooking the river is lovely, but even if the weather is not good they have a good amount of french doors so you can watch the river and wildlife from the warmth of being inside! The food is lovely too!! I enjoyed a visit to Cardigan Castle too - it was in a complete mess until the community/council took it on and totally renovated it, great to see the story of this unusual place and at £5 to get in I thought it was good value. As I say, I cannot rate the cottage highly enough - the kitchen had every utensil you could think of with plenty of pots and pan etc.. to cook whatever anyone would want, the beds were lovely and comfy (would have loved a kingsize in the master but thats personal pref! ), the views were outstanding. The owner Antony is lovely and answered my many questions and dealt with any emails very quickly. Thanks for a wonderful stay. Thanks for such a nice review Kerry. It certainly sounds like you packed a lot in to your two weeks. The Wales Coast Path runs alongside the cottage and a 10 minute walk brings you to a small sandy cove, just past the Cliff Hotel, where you can enjoy a dip or a beach barbecue. Another beach that we recommend for swimming is Mwnt, which is less than 10 minutes by car and offers parking at the top of the beach in a National Trust car park. Cardigan is less than two hours by car from Cardiff, which has the nearest international airport (a local airport at Withybush is 40 minutes away). The Fishguard car ferry with links to Ireland is around 30 minutes drive while the nearest mainline train station at Carmarthen is about 40 minutes drive. We would say that the use of a car is essential to get the most from your stay at Golygfa Deg. Cardigan town is less than five minutes drive away, providing access to a choice of cafes, restaurants and shops. Tesco and Aldi have supermarkets on the Gwbert-side of town and most high street banks also have branches here. Outdoor enthusiasts should seek out Cardigan Sports, bike hire and repairs are available at New Image Cycles and the Indoor Market has a range of interesting shops too. Please visit www.golygfadeg.co.uk for more information.